Date: Our walk is Sunday, Oct 20th, 2019. 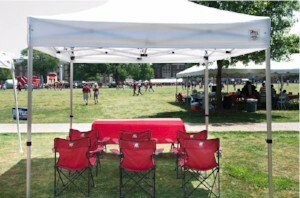 Time: Tent set up begins at 10:00. The event itself is 12-4pm with the walk around 3:00. Cost: Registration is only $10 and includes a t-shirt, lunch, and participation in all of the walk festivities. Participants with Down Syndrome can register for free! Kids under 3 are free but must pay to register if they want a tshirt. A portion of the funds will support the National Down Syndrome Society but the rest will serve as our budget for the year for all of the events and opportunities for our DSAL members. Do I have to create a team? Many families create a team celebrating their family member with DS. You do not have to create a team but it is a great way to get friends and family members involved in the day. Donations can always be made directly to DSAL on the main Buddy Walk page and need not be tied to an individual team. Multiple DSAL families are welcome to make a joint team together as well. Do we have to make team t-shirts? Whether your team makes its own shirts is up to you. When people register for the walk, that will include a buddy walk t-shirt. Some teams make team t-shirts, and what or if you charge your team members for them is up to you. The Hoove (http://www.thehoove.com/index.html) often gives our group a good price on shirts but it's up to you if you want to do a team shirt or not. Everyone who registers for the walk will get a buddy walk t-shirt on the day of the walk. Go to our Buddy Walk home page. Click on “Join Now”. This will walk you through the process. Select participant. From there, you can add personalized information to your page (story, picture, etc.) and set a fundraising goal. When your page is completed, you can share the link to your Team Page on facebook or email it to friends and family. With that link, folks can donate to DSAL under your team, join your team (this registers them for the walk), and even create a personal page for themselves to fundraise for your team. NOTE: If team members want to also donate to the team, they should do that as a separate transaction. If you donate while registering, the donation will go towards the event, NOT the team. This cannot be fixed without requesting a refund from Firstgiving. Though DSAL will still get that donation, it will not show up as part of the team’s total. 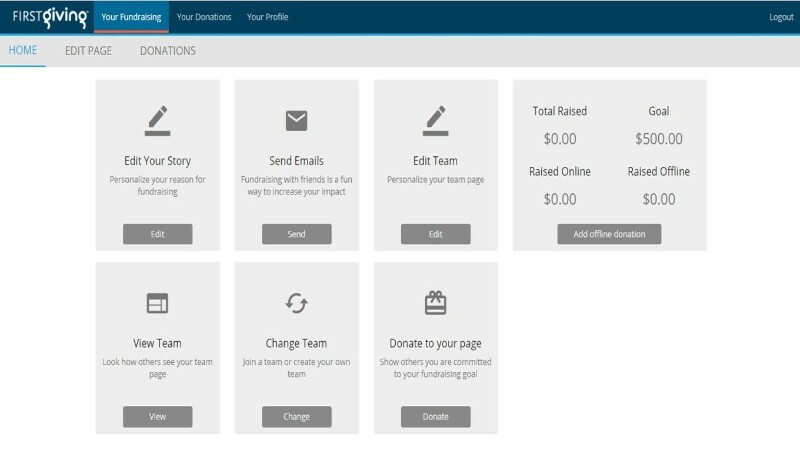 Below is a screenshot of an example of what your fundraising account will look like when you have created a team. Click on “Your Account” on the Firstgiving page. From here you can edit your team or personal page, add offline donations (any donations given to you personally, not through firstgiving), etc. If you run into trouble with creating your team, please let me know at dsalowcountry@gmail.com. Firstgiving tech support is also very helpful. Where do we park? Can I drive onto the grass for set up and unloading? There are 620 spots available in the paved Bishop England High School lot. Overflow parking will be in surrounding DI neighborhood and at the Benefit Focus/T Mobile lots on Fairchild Street off Daniel Island Drive. We absolutely cannot drive or park on the grass at the walk/Etiwan Park, even to unload. Please plan accordingly. What do we do the day of the walk?